Demonetisation has been the most disruptive moment in india's financial space, which may result in significant gain in long term. Finance Minister hints that not all the notes to be remonetised, that means digital currency will fill the gap. This can be termed as eMonetisation, creating a new normal. Getting cent percent people out of paper currency is a tough and impossible exercise, it will not happen in the near future. But there is all probability to translate a huge population to digital modes of currency. We have already seen a growth in cashless transactions soon after November 8 declaration. Digital modes of payments are already there in our system, but the adoption rate was not that much high. Now it is the high time to migrate to electronic modes. There are couple of ways to put you to digital transaction trajectory. In near future, it is not possible to convert 25 to 30% of population- bottom of the pyramid- to cashless environment, but at the same time it is much easy to convert same percentage in the upper strata to less cash regime. It is the high time to shift our transaction behavior to tune with present currency crunch situation. This disruption that has been happened is pushing many people to newer modes of payments. If you are ready to migrate to digital currency, these three methods would be helpful. Plastic Cards: As of August 2016, 712.46 million debit cards and 26.4 million credit cards are in circulation. But till demonetisation, our cards are mostly used in ATMs to withdraw currency. We have about 2.25 lacs ATM centers across the country, and 14 lacs POS terminals at merchant outlets. The sad point is that POS terminals are under utilised, at the same time we are over depending on ATMs. The same debit card which we are using to take money from machine can be given at shops, medical stores, bill payment spots, fuel filling stations etc. Here money from your account instantly gets credited to merchant account via electronic mode. 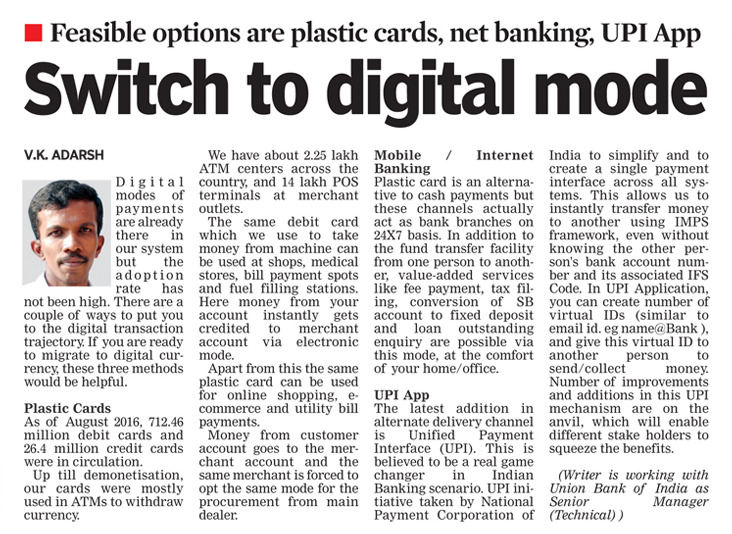 Apart from this the same plastic card can be used for online shopping, e Commerce and utility bill payments. If a majority percentage of our netizen rebooting their style of transactions to card payment mode, the impact in the cashless economy would be high. Here money from customer account goes to merchant account and the same merchant forced to opt the same mode for the procurement from main dealer. This is a circle and slowly this 'new normal' would create a conducive environment to state as well as union government in many ways. Mobile / Internet Banking : All most all the banks are now equipped with their own mobile and internet banking products. Plastic card is an alternative to cash payments, but these kinds of channels are actually acting as bank branches on 24X7 basis. In addition to the fund transfer facility from one person to another, value added services like fee payment, tax filing, conversion of SB account to fixed deposit, loan outstanding enquiry etc are possible via this mode, at the comfort of your home/office. Once the customer is experienced with mobile/internet banking channels, then all chance to stay tuned with this window of banking, and this would help to bridge gap between cash and cashless banking. 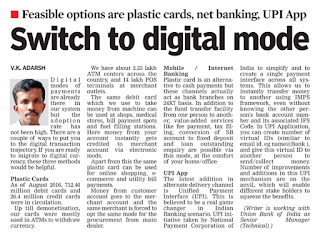 UPI App: The latest addition in alternate delivery channel is Unified Payment Interface, or simply UPI. This is believed to be a real game changer in Indian Banking scenario. UPI initiative taken by National Payment Corporation of India to simplify and to create a single payment interface across all systems. This allows us to instantly transfer money to another using IMPS framework, even without knowing the other person's bank account number and its associated IFSCode. In UPI Application, you can create number of virtual IDs (similar to email id. eg name@Bank ), and give this virtual ID to another person to send/collect money. Number of improvements and additions in this UPI mechanism are on the anvil, which will enable different stake holders to squeeze the benefits. One thing is sure, a slow and steady translation to less cash environment is taking place since long, and demonetisation acted as catalyst to spur the growth. This digitisation of currency flow will help banks in many ways and may lead to lower interest regime. We are in the process of conversion, and have to continue to make some efforts in order to keep this momentum. Once the transaction behavior is changed to eMode, then it is for a long time.